Review: Kin – Royal Court *** | Fourthwall Magazine & The Drama Student – The magazine for careers in the performing arts – actors, drama students, directors, producers, writers, production crew. At the Royal Court, JBR finds an uneasy tale of boarding school to be spine-tingling but lacking real chill. Pre-teen relationships are fraught with danger, and innocence lost is a key theme of E.V. Crowe’s new play, Kin. Playing Upstairs at the Royal Court, Kin is set in a girl’s boarding school in the 1990’s where Bunny Christie’s marvellously shabby, institutional set creates the perfect atmosphere of decay. The muted greens and greys, bunk beds, strange noises from without and abrupt shifts in lighting all amplify the prison-like nature of this society. Crowe’s zippy dialogue whizzes along, laying waste to any pretensions of schoolgirl purity. In crisp, upper middle class accents, the girls swear and curse with the wearied sophistication of women three times their age. Crowe deftly punctures the illusion that girls boarding schools are all jolly hockey sticks and lacrosse. Here, the friendship between two roomies plays out like a sadistic battle of wills. Director Jeremy Herrin graces the action with some memorable, haunting images; the silhouetted watcher at the door, demonic faces singing Christmas carols and he coaxes outstanding performances from the lead girls, all children, playing ten and eleven year olds. Madison Lygo as Janey is particularly unnerving as a pre-pubescent bully, and Ellen Hill as Nina, who mostly observes the others, is rather affecting. When Mimi, an excellent Maya Gerber, is cast as Proctor in the school production of The Crucible, the parallels between Miller’s drama and Crowe’s are drawn clearly if crudely. The subtext and comparisons feel unnecessarily tacked on. 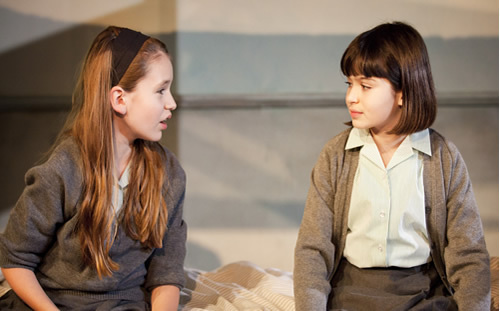 The play is most effective when focussing on the girls claustrophobic, sexually charged lives. Herrin directs with detail without forcing the symbolism of the piece. The atmosphere is genuinely spine-tingling at points, but Crowe’s writing feels like an unfinished draft. There are pacing problems in the text and while it effectively conveys a sense of menace and unease, ultimately, at a mere 70 minutes, Kin falls short of saying anything at all, never fully exploring its themes and so never really chilling the audience as it might.